Create a custom invitation to a garden party or on-farm dinner. Slip a packet of organic heirloom seeds in with the cards and give a set as a hostess or teacher gift. 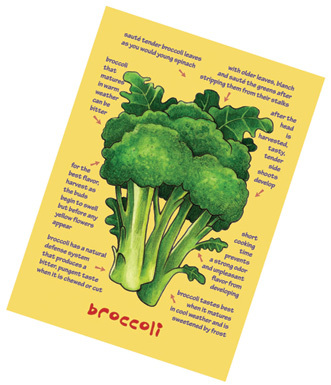 Write a thank you note to a friend and add your favorite recipe using the fruit or vegetable featured on the card. Attach a packet of seeds inside and use as a take-home place card at a garden dinner or country wedding. Keep a set in your own kitchen as a handy cooking reference. Punch a hole in the upper left corner, insert a colorful ribbon, and use as a gift tag on a set of handmade wooden spoons, wheel of local farmstead cheese, potted herb plant, or your own special homemade treat. Use as a birthday card and add a gift certificate to a local farm stand or an invitation to join you at your favorite local restaurant. For a colorful, light-hearted decorative touch, hang a framed set of cards in your kitchen.